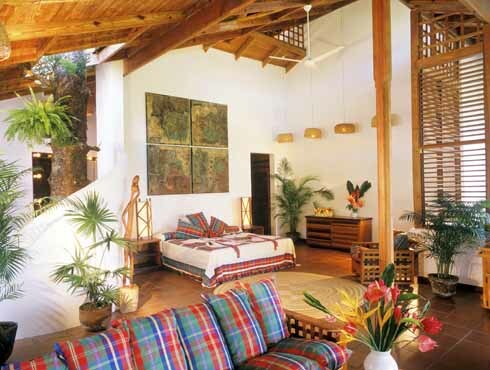 The island that is fast becoming the honeymoon capital of the Caribbean will also provide divers with pleasant memories. 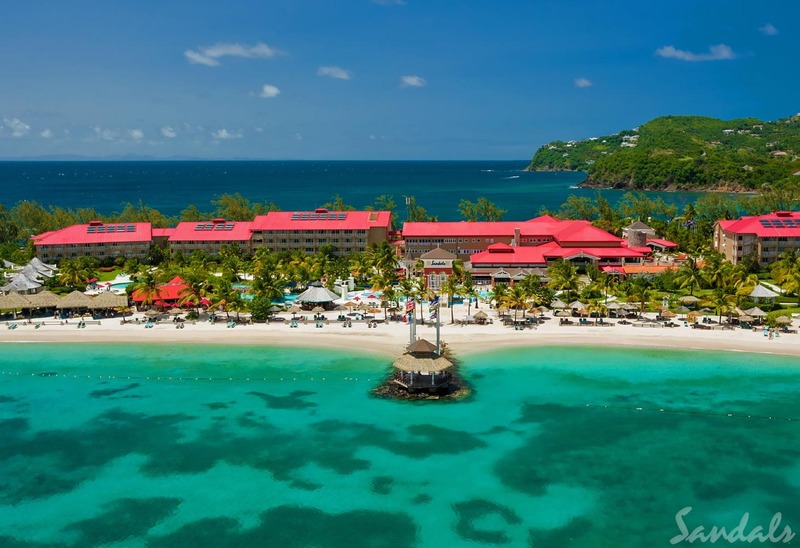 The sloping reefs and walls that run close to Saint Lucia's calm western coast are covered in vibrant multi-hued carpets of gorgonians, black coral trees, sponges and lace coral. Intricate crevices and fissures carve these surfaces into habitats for a wealth of reef fish and invertebrates, while nearby pinnacles rise from the deep water to attract swirling schools of both predators and prey. Shipwrecks and a mysterious serpentine creature known as “The Thing” add to the allure of a topside landscape that is also known for its stunning natural beauty. Most dive sites are close to shore, where narrow coastal ledges at depths of 15 to 30 feet transition to slopes. The majority of these sites are accessed by boat, but there are also several excellent shore dives. Some slopes are gentle and lead to intermediate depths, others are steep to vertical, and drop to depths below 100 feet. Additional features include pinnacles, boulder fields and underwater canyons. Saint Lucia is known for colorful sponges, hard and soft coral growths, and for a high diversity of reef-dwelling species. Water temperatures follow a narrow seasonal range from 78 to 82 degrees. 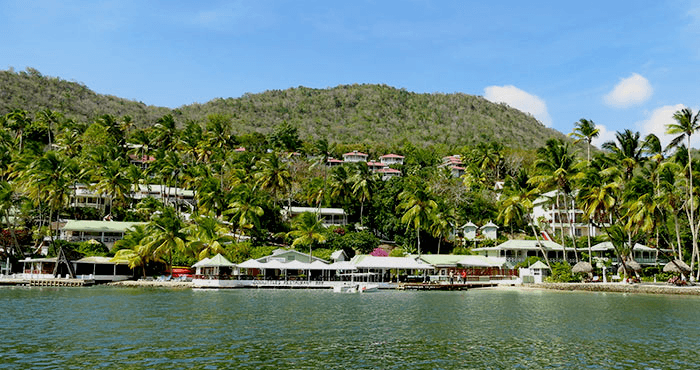 Saint Lucia offers a wide variety of diving experiences that could count towards advanced and specialty certifications, including drift, wreck, shore, night and deep profiles. Benign conditions put all of these experiences within the grasp of most every diver, making this a great destination to expand your diving horizons. Whether you arrive by boat or wade in from shore, the coral slopes of Anse Chastanet never fail to delight. Adrift along the wall at Fairyland reveals a riot of brightly colored sponges and corals. The Keyhole Pinnacles rise from the depths to attract fish to slopes covered in black and orange sea fans. The wreck of the Leslie M is a wreck dive for all, while a deeper dive reveals the twisted machinery of the Daini Koyomaru. Divers can imagine they are soaring along the submerged base of Petit Piton when propelled by the currents at Superman's Flight. A 3mm wetsuit will suffice year-round. Though dives are guided, a surface marker is a good insurance on drift dives. A muck stick will help stabilize as you approach reefs for closer looks at small creatures. A small narrow-bean light will illuminate the crevices. CASTRIES - SPRING SALE includes 7 night Luxury accommodations, 5 days of 2-tank boad dives, breakfast, lunch and dinner daily including beverages and wine served with lunch and dinner, one 50 min treatment per day from select menu including fully customizable wellness experience, free WiFi, roundtrip airport transfers, hotel tax and service charges. Valid 7/1/19-8/30/19. Book by 5/28/19. SOUFRIERE - SAINT LUCIA DIVE FEST PACKAGE includes 7 nights run of house accommodation, participation in the Dive Fest special activities, 12 beach or boat dives incl of tank, weights, belt, mask, snorkel, fins (other equipment at a charge if needed, marine park fee to be paid locally), breakfast, lunch, afternoon tea and dinner, sunrise and sunset yoga, non-motorized watersports. non-diving companion Dive Fest package includes welcome and farewell dive fest party, Lionfish Feast Dinner, Jazzy Sunset cruise, a jungle biking tour and optional scuba beginner’s course for free, roundtrip airport transfers, hotel tax and service charges. Valid 9/8/19-9/15/19. GROS INLET - 15% OFF includes 7 night Ocean View accommodations, 5 days of 2-tank boat dives, breakfast daily, free WiFi, roundtrip airport transfers, hotel tax and service charges. Valid 8/19/19-10/10/19. Book by 4/6/19. Additional dates available at varying rates. RODNEY BAY - $65 PER NIGHT DISCOUNT includes 7 night gardenview accommodations, 5 days of 2-tank boat dives, welcome beverage, breakfast daily, free WiFi, roundtrip, bottled water upon arrival, $150 per room resort credit, complimentary shuttle between Bay Gardens properties, complimentary non-motorized watersports, airport transfers, hotel tax and service charges. Valid 5/14/19-12/19/19. SOUFRIERE - 7-NIGHT DIVE SPECIAL includes 7 nights accommodations, 12 beach or boat dives, welcome cocktail, breakfast, lunch and dinner daily and afternoon tea, use of non-motorized watersports, roundtrip airport transfers, hotel tax and service charges. Valid 6/1/19-10/31/19. Additional dates available at varying rates. SOUFRIERE - DIVE PACKAGE includes 7 nights pool sanctuary accommodations, 12 beach or boat dives, welcome drink and tropical fruit display, breakfast, lunch and dinner daily, use of non-motorized watersports, roundtrip airport transfers, hotel tax and service charges. Valid through 10/31/18. Add $520 pp/dbl for travel 11/1/18-12/19/18. SOUFRIERE - DIVE PACKAGE includes 7 nights pool sanctuary accommodations, 12 beach or boat dives, welcome drink and tropical fruit display, breakfast, lunch and dinner daily, use of non-motorized watersports, roundtrip airport transfers, hotel tax and service charges. SOUFRIERE - DIVE PACKAGE includes 7 nights accommodations, 6 days of 2-tank boat dives, welcome drink and culinary amenity upon arrival, 3 meals daily with afternoon tea, roundtrip airport tranfers, hotel taxes, and service charges. 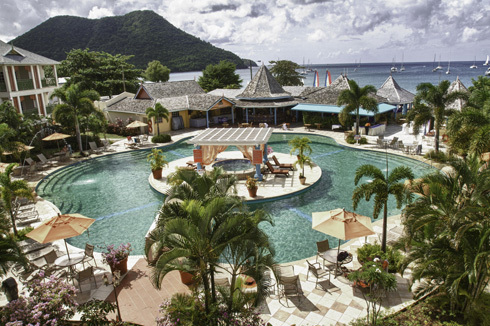 Saint Lucia is kind to divers seeking easy explorations of colorful reefs. But it is equally accommodating of those who want to ride the currents or explore the depths. 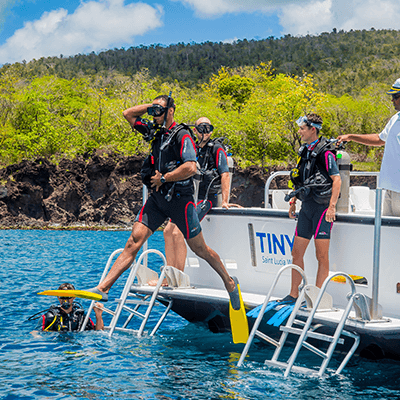 Sites on the island's west coast to the north of the town of Castries and near the Pigeon Island National Monument offer some of the most relaxed diving environments. This area includes a number of shallow reefs that can be accessed from shore, with slopes that begin at depths of 15 to 20 feet and drop gradually to 40 to 60 feet, with numerous trenches and shelves to explore. Also in the area are several exposed rock islands that rise from an intermediate sand bottom, with profiles that attract eagle rays, barracuda, kingfish and schooling snapper and jacks. Near Pigeon Island, a field of large boulders provides hiding places for moray eels and a variety of crustaceans. Close to the entrance of Castries Harbor, the broken remains of a World War II-era vessel sit at a depth of 45 feet, creating habitat for lobster and shy marine life. 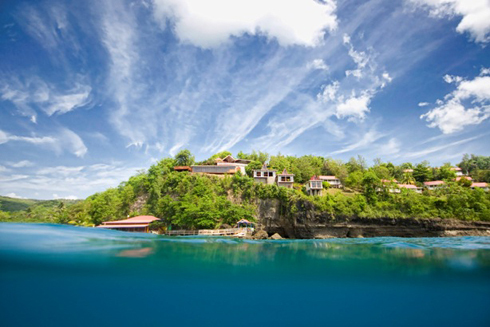 The underwater landscape transitions to steeper slopes as you move south, and many of Saint Lucia's most popular and dramatic dive sites are situated on the west-central coast of Anse Cochon and the Anse Chastanet region. This area includes two wrecks and a range of walls, pinnacles and reefs slopes with vertical drops of more than 100 feet. Mild currents are encountered at some sites, making for enjoyable drift diving opportunities. Notable sites include Anse La Raye Wall, where eagle rays often follow divers on a drift along a sloping wall that drops to a depth of 110 feet. Anse Cochon delivers walls, pinnacles, coral heads, boulder fields and sandy shallows on a single dive, and the semi-circular Turtle Reef is covered in the large barrel sponges that are a signature of many Saint Lucia dive sites. Nearby, the 165-foot cargo vessel Leslie M sits upright at a depth of 65 feet. The open hold and shallow pilothouse of this wreck are ideal for first-time wreck divers and a good place to search for small marine life. A mile to the west, a huge abandoned dredge, the Daini Koyomaru, sits on its side at a depth of 100 feet, with its machinery intact and awaiting exploration. 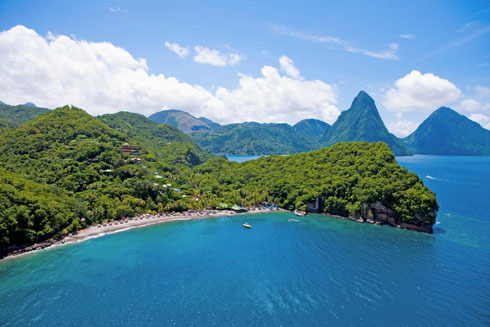 Saint Lucia's most famous dive sites are found near the twin volcanic spires known as the Pitons. Most famous is the House Reef at Anse Chastanet, which is done both as a shore dive from the resort of the same name, or by boat. Dropping from depths of 25 feet to beyond 140, this reef supports more than 150 species of fish, including a rarely-seen creature known as “the thing,” which resembles a giant worm. An adjacent site that is the subject of countless photographs is the projecting point known as Fairy Land, where more frequent currents nurture riotous, multi-color growths of soft corals and sponges. Two of the island's more adventurous sites are also nearby. Superman's flight is a drift dive along a wall at the base of Petit Piton that carries divers along a wall that plunges to more than 1,000 feet. With typically excellent visibility, this profile creates the sensation of weightless flight. The Keyhole Pinnacles are a group of four tall spires that perch close together on the edge of a steep slope, reaching almost to the surface. Divers can swim into the narrow gaps between these monolithic formations to discover a wealth of fish and invertebrates. 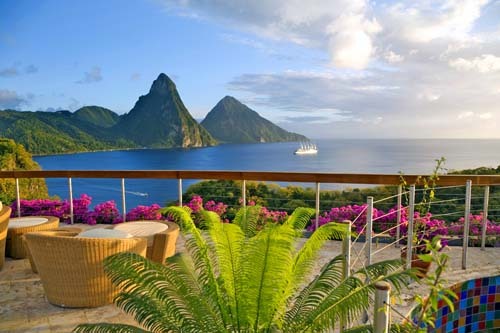 Saint Lucia is on Atlantic Standard Time (AST) and does not observe Daylight Savings Time. 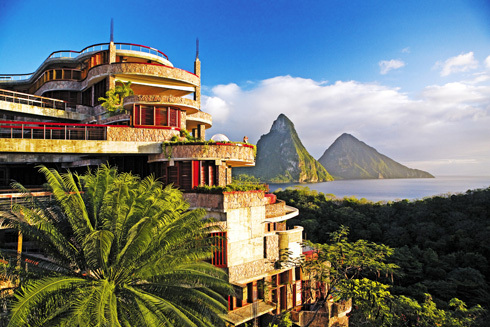 St. Lucia is 4 hours behind Greenwich Mean Time (-4 GMT).